Weight: Lillie 17.5 lbs, Jack 20 lbs, Bonnie 17.6 lbs, Joey 18 lbs. 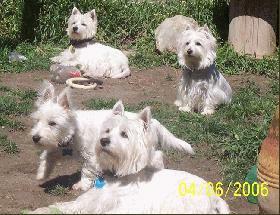 Favorite food: All four love the Westie diet, baby carrotts, and TREATs. Favorite toy: Duh anything we can get our paws on!!! Special talents: Home demolition...Seach and Destroy! Most embarrassing moment: What's that!!! My favorite friends: Each other, and everyone we meet. Biggest adventure: We have been sworn to secrecy.